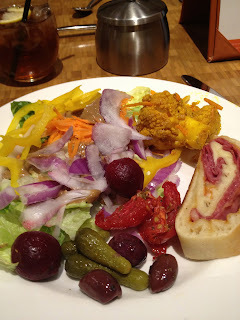 LAS VEGAS DAZE: THE Buffet at Aria 2/20/2013, not the best! THE Buffet at Aria 2/20/2013, not the best! February's trip which was to celebrate Valentine's Day with my husband and then a couple days later to celebrate my friend Lowrance's 60th birthday was a long trip of 7 nights for me. There will be a complete trip report where I'll provide links to some of the sections that I'm doing separately for ease of reading and also finding the information later so it's not buried in a long trip report! 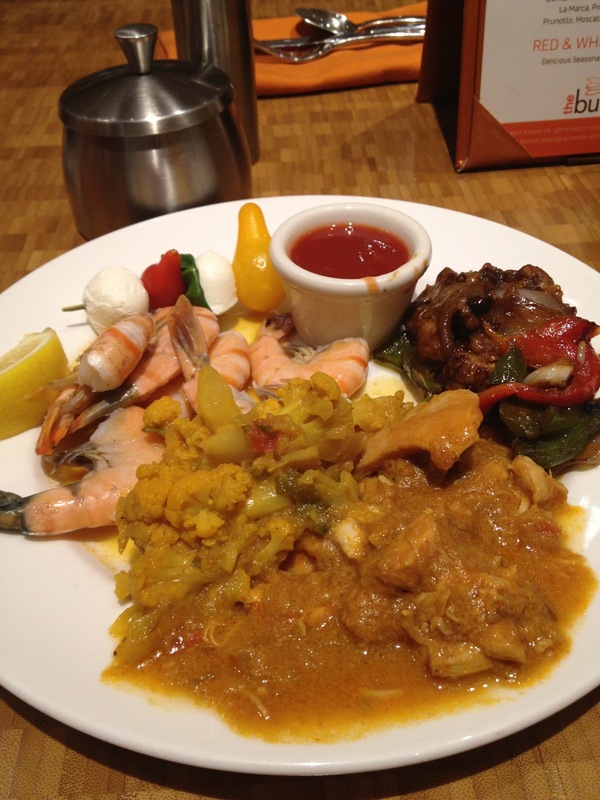 I ate at the newly renovated Aria Buffet for lunch on the last full day of my February Vegas trip. 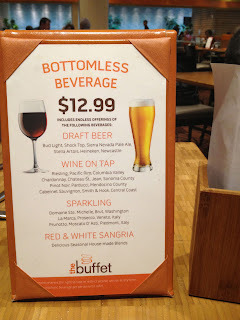 The price of the buffet at first glance isn't bad at around $20 per person and they have a option for unlimited alcohol for a extra charge, which I skipped. After tasting the food I was sorry I didn't buy one of the unlimited drink packages as I'm sure drinking a lot would have made the food taste better. One of the few things I did like with this buffet was the stuffed bread with cheese and sausage! 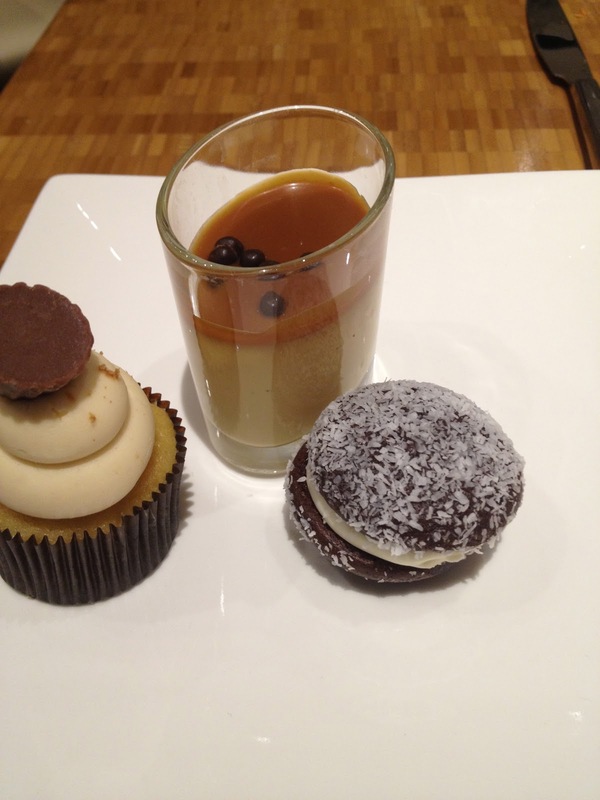 The desserts looked a lot better then they taste in my opinion though the cupcake was okay. The following photos show the wide variety of selections of food available for lunch. I had no complaints as far as variety of choices. The desserts looked lovely but the ones that I tasted did not live up to their appearance. Decent selection of ice creams and sorbet. I didn't try any so it's possible this dessert is good. The donuts, croissants, etc..above were with desserts. By the way I had to wait and take photos after I was finished eating as when I first sat down at 1pm a lot of the food areas was waiting to be replenished and didn't look very good! I didn't try the snow crab it looked like more work to try to get the dried out looking crab out of the shell then it was worth. The shrimp which I ate was fine, but I prefer my shrimp shelled, not peel and eat. The cheese selection was limited but okay. I didn't try the carrots or lasagna. The above represented the breakfast selections available for lunch. The fish and chips just didn't look good to me, but it's possible they tasted okay. I love indian food but this was just average. I've had better chicken curry from Trader Joe's, (sigh). I thought tandoori chicken and Naan was suppose to be a big deal at this buffet but if it was available it was well hidden and I couldn't find them. There were six different soups that I saw available. No steam coming from them and they looked luke warm and unappealing to my eye. Deli meats looked fine and might taste good, I didn't try any of them. It was hard to serve yourself to some of the salad items due to the reach involved. I thought the salad presentation was cute with the crates and mason jars but not very practical as far as serving oneself from the mason jars that weren't in the first row. Above are some cold salads like potato and tuna. The salsa, sour cream, guacamole, etc...were in a different area then the Mexican main dishes. Unfortunately I didn't see them in the first pass to add to the Mexican meat I tried which might have improved it. Not sure why they have this so separated from the main Mexican station. The selection of meats available weren't that great in my opinion. I did try the beef brisket which was okay. There wasn't any prime rib available for lunch. None of these side dishes were appealing to me so I don't know what they tasted like. The chicken looked like grocery store rotisserie chicken which is fine I guess. The turkey looked dried out to me. The ham just didn't look that good to me either, but then perhaps I was just expecting to much after trying the new Bacchanal buffet at Caesar's which admittedly is a lot more money. The Mexican hot selection of food. Typical looking buffet sushi, unless one goes to a high end Vegas brunch. The Indian breads above were just disappointing. There are so many great Indian type breads to serve that I really feel they missed the mark here a lot! Whatever this was suppose to be making for the Indian station it wasn't doing it for the lunch crowd. 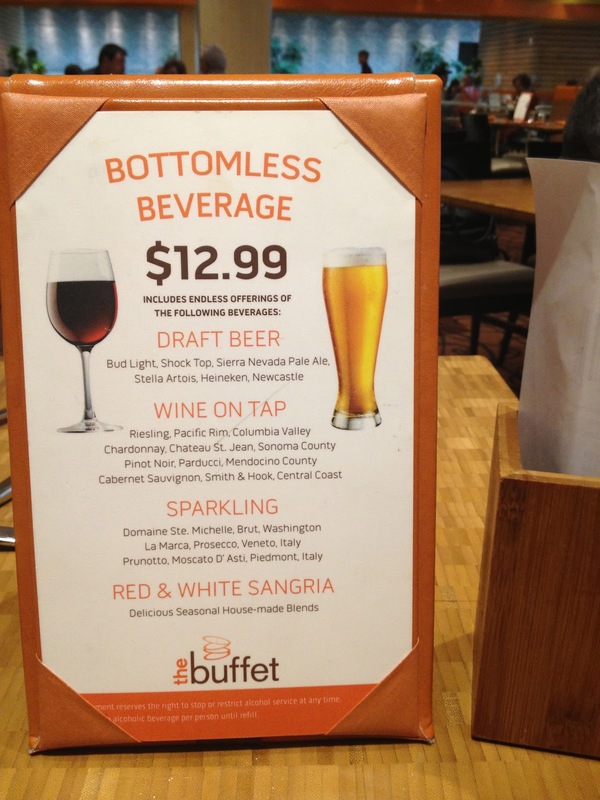 Final thoughts on this buffet is the price isn't bad, the selection of items is good but the food quality is very mediocre, especially for a resort property that inspires to be considered upscale! Better to walk over to do the Bellagio buffet which is about the same price for lunch. Better yet play Myvegas on Facebook for free and get 2 free Bellagio buffets! I agree with you, Evoni. And since I ate 5 of those Aria buffets in 3 days, I'm over it! The gelatos were the best thing there. 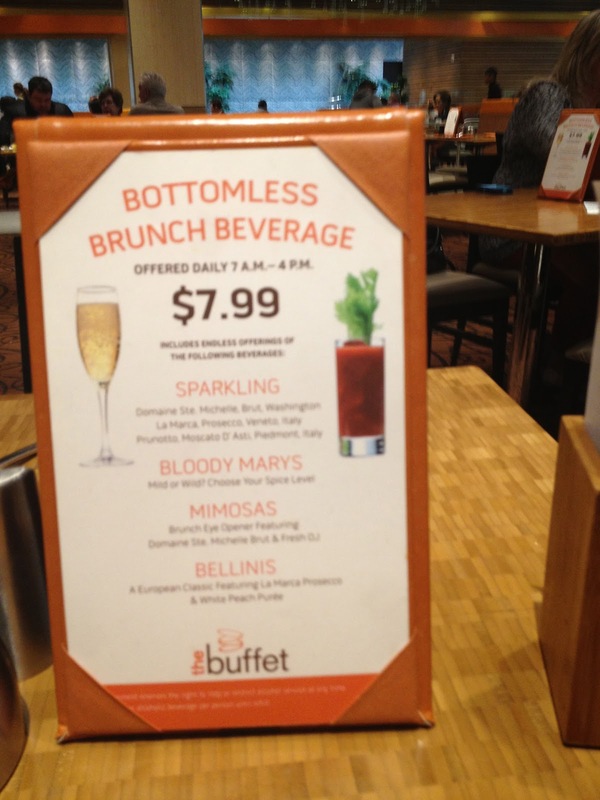 Bellagio buffet passes have been sold out on Myvegas for quite some time. 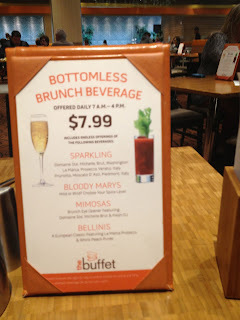 I have found that sometimes they restocked the Bellagio buffet passes on MyVegas rewards between 7am to 7:15am pacific time. Hi Diana! Love your blog. I completely agree with you about the Aria buffet. I ate there a couple weeks ago and could have written the same review. Disappointing. I'm glad it was a part of my food comps as the price does not match the quality. Wynn's Country Club Jazz Brunch revisited 2013! Chinese New Year, Vegas Style!